Without ever leaving her convent on the outskirts of Assisi, Saint Clare founded orders of nuns throughout Italy, France, and Germany. Though she maintained a vow of silence, popes, cardinals, and royalty came to her for spiritual advice. Only twelve years younger than her mentor, Saint Francis of Assisi, she quietly helped him lead a movement of young people that confronted the church hierarchy for their material excesses, and revolutionized religious expression by embracing simplicity and poverty. Chiara Offreduccio was the daughter of a wealthy count and countess in Assisi, Italy, and displayed little interest in the worldly advantages offered by her highborn state. She was eighteen and destined for an arranged, profitable marriage when she heard Saint Francis deliver the Lenten sermon at her church. Inspired by his simple message of living with complete trust in God, she conspired to run away and live like this new order of mendicant friars, dependent solely on alms received from begging. The turning point for her occurred on Palm Sunday, 1212. On that day, Clare went to the Cathedral of Assisi in her finest clothes for the blessing of the palms. While others went to the altar rail to receive their palms, she sat in her seat, too shy to move. With the entire congregation as witness, the bishop stepped down from the altar and delivered the palms to her. She took this as a sign to act on her plan. Homes in Assisi were built with two doors, one for regular use and one called the Door of the Dead, opened only to remove a coffin from the house. That night, Clare secretly cleared the debris from the Door of the Dead and stepped through it, renouncing her former life and the material world forever. She slipped through the woods to the chapel of the Porziuncola, where Francis and his small community of men were at prayer. Clare exchanged her finery for a penitential tunic of coarse cloth tied with a rope, and Francis cut off her luxurious hair in front of the Blessed Virgin’s altar. Having no separate living facility for women, he then took her to the local Benedictine convent. Clare’s family embarked on a rescue mission, sparing no expense. During a violent struggle to drag Clare from the convent, her clothing was torn off, and her shorn hair revealed. She declared to her shocked father, “The only spouse I will have is Christ, and further attempts to remove me from my chosen life will make me more steadfast!” Her powerful father had to submit to her will and leave her behind. To his great anguish his younger daughter Agnes joined Clare just two weeks later. Thus began a fashionable tradition of wealthy young women turning their backs on privilege and society in order to follow a higher spiritual path. Francis of Assisi had offered his peers a way of living that shook the foundations of society in the Middle Ages. Instead of becoming dependent behind the walls of staid, established religious orders, he encouraged his followers to exist in a day-to-day manner, experiencing nature and depending on the goodwill of others. The joy he and his band of friars exuded was infectious and he developed a following wherever he went. Clare was the first young woman with the courage to join him. In 1215, when Clare was twenty-two years old, Saint Francis installed her as the Abbess of the Order of Poor Ladies in a small house across from the Church of San Damiano. These women followed the Franciscan rule, forbidden to own property or material goods and entirely dependent on the alms the Friars Minor could beg for them. Upon the death of her father, Clare did not veer from Saint Francis’s teachings. She gave her vast inheritance to the poor rather than to her own religious community. This act of devotion caused much controversy–Church authorities expected women to give their dowries to the religious orders they joined. This was to ensure that the nuns would be supported throughout their lives and would not serve as a burden to their parish communities. Because she was the founder of this order of women, Clare set a precedent for future Franciscan convents. Despite this disagreement with church hierarchy, convents of Poor Clares, as the order became known, were started in cities all over Italy, gradually spreading to France and Germany. These first convents attracted many educated and wealthy women who not only walked away from titles and estates but also lived in a state of self-imposed austerity that was considered extreme for men and unheard of for women. They went barefoot, wore sackcloth, slept on the ground, ate no meat, and maintained a vow of silence, speaking only out of necessity. Agnes, daughter of the King of Bohemia, broke her engagement to become Empress of the Holy Roman Empire to start an order of Poor Clares. The correspondence between Agnes and Clare leaves a lasting portrayal of the intellectual brilliance and good nature of the order’s founder. Because of her great mind, Saint Clare was an invaluable adviser to Saint Francis. When he was wrestling with the choice of becoming a religious hermit or going out in the world to evangelize his movement, she encouraged him to go out to the people. It was Clare who nursed Francis through the last days of his life, and it was under her care that he composed his greatest work, “Canticle of the Sun.” After Francis’s death, Clare could never be convinced to relax his strict rules of poverty, remaining the most loyal adherent of his teachings. Though she was abbess of her own order of nuns, Clare lived as humbly as possible. She served at the table, tended the sick, and washed the feet of the lay sisters when they returned from begging. Because of the austere manner in which she lived, Clare’s health suffered, and like Francis, she had the reputation for mystical powers. When she prayed, she exuded a rainbow aura and enjoyed a silent rapport with animals. While bedridden, she would embroider altar cloths for neighboring churches and her cat would bring her whatever she needed. Even when ill, Clare remained a powerful spiritual force. In 1234, the army of Frederick II was at war with the Papal States, and the convent of Poor Clares in Assisi came under attack by a band of Saracen mercenaries. Clare rose from her sickbed and took a monstrance containing a host from the chapel. While ladders were being set up for the invaders to scale the walls, Clare calmly prayed, “Does it please Thee, O God, to deliver into the hands of these beasts the defenseless children whom I have nourished with Thy love? I beseech Thee good Lord, protect these whom now I am not able to protect.” She then heard the voice of a child saying, “I will have them always in my care.” In response, she turned to the terrified nuns and told them to have no fear but to trust in Jesus. In that instant, the attackers were seized with an incredible wave of dread and they fled the convent. The citizens of Assisi credit Clare with saving them from a later assault by the same army. Telling her nuns that they needed to support the city that had given them so much charity, she had them pray day and night until the attacking army inexplicably gave up and retreated. Two days before her death at the age of fifty-nine, Pope Innocent IV approved the rule for her order, which she had formally written herself. As she lay on her deathbed, her sister Agnes and the early followers of Saint Francis were at Clare’s bedside, reciting the same prayers for her as they had said for him. 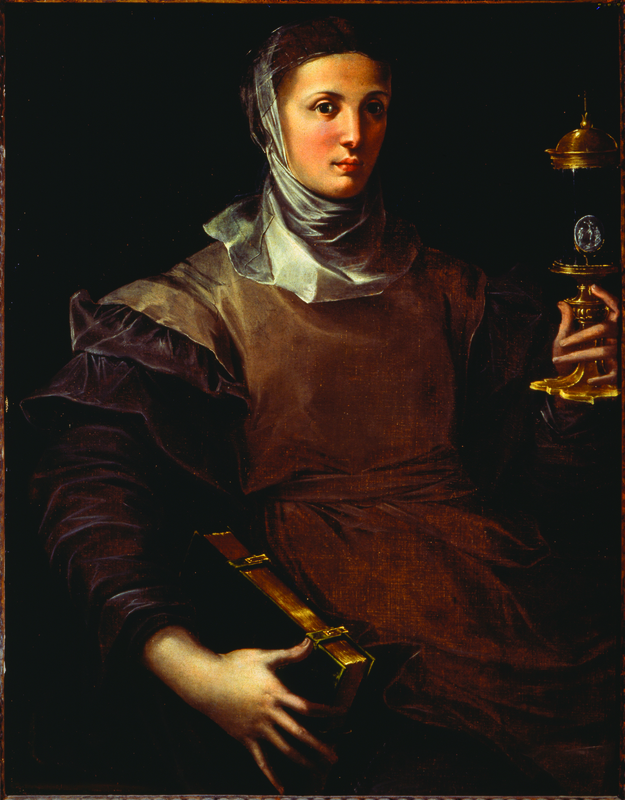 In art, Saint Clare is usually depicted holding the monstrance that she held in driving out the Saracens. Those working in embroidery as Clare did, frequently suffer from eye problems, and so she is their patron as well as patron to those who treat the eyes. Because gold work requires intense use of the eyes, gilders are also under her patronage. Because her name, Chiara, means clear, she is called upon for clarity of vision. Since laundresses work at dawn and her name reminds one of the effects of the rising sun, they are also under her protection. Vision and clarity accompanied Clare throughout her life. When she was too ill to attend Christmas midnight mass, she was able to visualize it on her wall, amazing those who did attend by relaying exact information of the events. Because of this miracle, she was named the patron of television, telegraph operators, and the telephone in 1958. Go forth in peace, for you have followed the good road. Go forth without fear, for he who created you has made you holy, Has always protected you, and loves you as a mother. Blessed be you, my God, for having created me. Amen. This entry was posted in Novena, Prayer, Saints by sandra dipasqua. Bookmark the permalink.